Soil is life! Your soil is your body, the more you nourish it, the more it comes out fine to give you good result. There are number of ways you can take care of your soil and still be friendly to your environment. ISFM knowledge combines all. 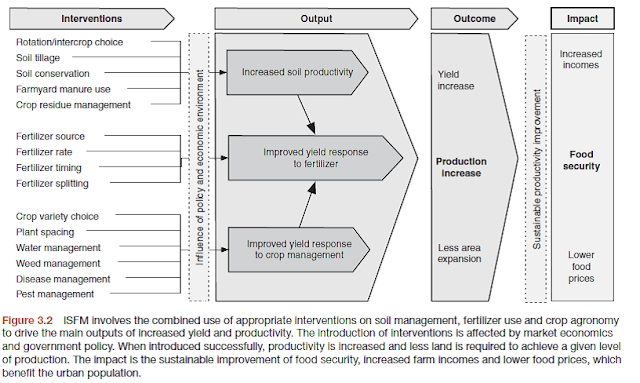 This article was put together to enlighten you on what ISFM is and also IPM (Integrated Soil Fertility Management). These two management practices are interwoven which means, there is no way you want to get outcome from ISFM without practicing IPM alongside and vice versa. 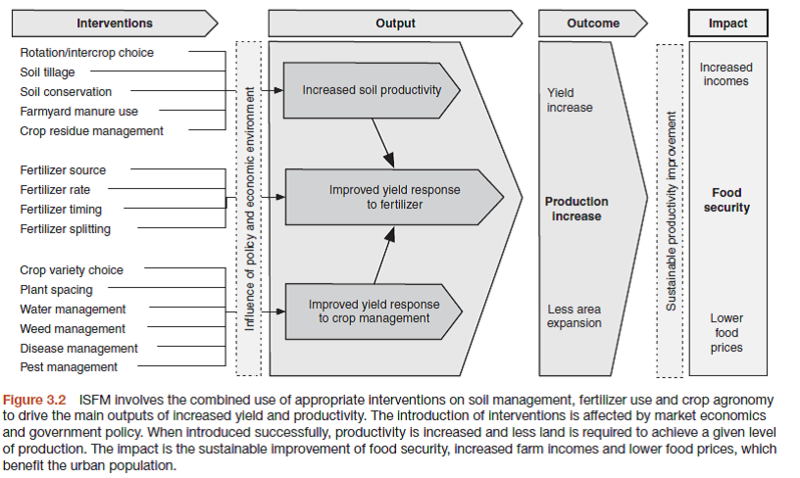 Integrated Soil Fertility Management is a set of soil fertility management practices that necessarily include the use of fertilizer, organic inputs and improved germplasm combine with the knowledge on how to adapt these practices to local conditions, aiming at optimizing agronomic use efficiency of the applied nutrients and improving crop productivity. You might want to ask; what is all this noise about ISFM and why should you too practice it. - Over the next 40 years, the population of Sub-Sahara (SSA) African would increase by 700 million inhabitants. - There would be stiff competition over already a scarce natural resource: Size of farmed hectare-age of arable land. - To ensure balancing of ecosystem. Organic inputs (crop residues and animal manures) are a set of locally available materials that can be used to improve soil structure and nutrients over time. They could be from animal or plant sources and not necessarily from animal source as people usually think. Plant materials especially is rich source of Carbon which provides energy source for soil microorganism which drive various soil biological process that enhance nutrients transformation and availability in the soil. They include the use of animal dropping such as poultry manures, compost, herbaceous legumes (e.g cover crops) or dual purpose grain legumes (e.g. Soya beans). It also includes rock such as lime. The decomposition of all these is the backbone of soil fertility. - Organic inputs release not only major nutrients such as Nitrogen, Phosphorus and Potassium but also release micro nutrients which are essential to plant well being. - Increases the crop response to mineral fertilizer. - Improves the soil’s capacity to store moisture. - Regulate soil chemical and physical properties that affect nutrient storage and availability as well as root growth. - Create a better rooting environment. - Improving the availability of phosphorus for plant uptake. 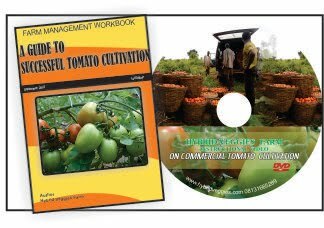 - Ameliorate problems such as soil acidity. - Replenishing soil organic matter. These are industrially produced chemicals meant to supplement the deficient nutrients in the soil in order to give plant maximum soil requirements with corresponding increase in yield. 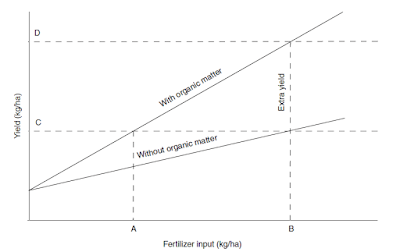 Fertilizers are concentrated sources of essential nutrients in a form that is readily available for plant uptake. - It is often less costly than animal manures in terms of cost of the nutrients that they contain (i.e., $/Kg nutrient) but often viewed as more costly by farmers because they require a cash outlay. 2000 kg of poultry manure contains around 2.4kg of N (Nitrate available for plant use) while just 240kg of Urea contains 24kg of N (Nitrate available for plant use). These are set of seeds or seedlings which have been worked on to improve their yield and all other corresponding properties such as resistance to diseases, adaptation to local environment etc. ISFM isn’t a one size fit all approach. The form of ISFM measure that would be taken up in a locality depends on the available materials. 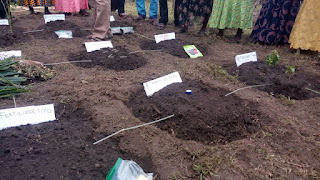 A farmer with easy access to manure will likely opt to use a combination of manure and fertilizer while another without access to manure will have to use more fertilizer while sourcing for manure from non-conventional sources such as compost. - Application of local rock materials such as lime to amend the soil. Lime increases the soil pH which facilitates the release of Calcium/Magnesium and Phosphorus/Molybdenum. This prevents release of Aluminum and Manganese which are harmful to crops. As good as the use of inorganic fertilizer looks; there are basic things that must be understood to ensure the fertilizer efficiency. - Sandy soil: Sandy soil has low buffering capacity therefore it is advisable not to use ammonium sulphate based fertilizer as a source of Nitrogen due to its soil acidifying potential. - In heavy rain prone areas; use ammonium based fertilizer for source of Nitrogen as against Nitrate based fertilizer which is prone to leaching. 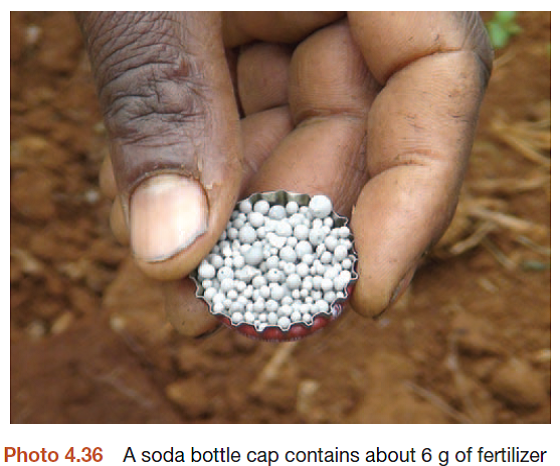 A full level soda bottle top contains about 6g of fertilizer and this can be used as a parameter for measurement. - The conversion rate is small; an average of 2 tons of manure would give 2.5kg of N and 0.6 Kg of Phosphorus while just 240kg (5 bags) of urea give 24kg of N.
- Cultivation of unmarketable cover crops only leads to recycling of poverty making the use of organic sources (Plant materials) not practicable. - Amendment of soil pH: Acidic soil is most common and it is cause by continuous use of ammonium base fertilizer (Urea). Low pH has high exchangeable Aluminum content which restricts the growth of crops. It can be corrected with liming or the use of aluminum sulphate in the case of high pH. - Management of micro nutrient deficiencies: The focus is often on the major nutrients, micro nutrients also play important roles in plant well being. 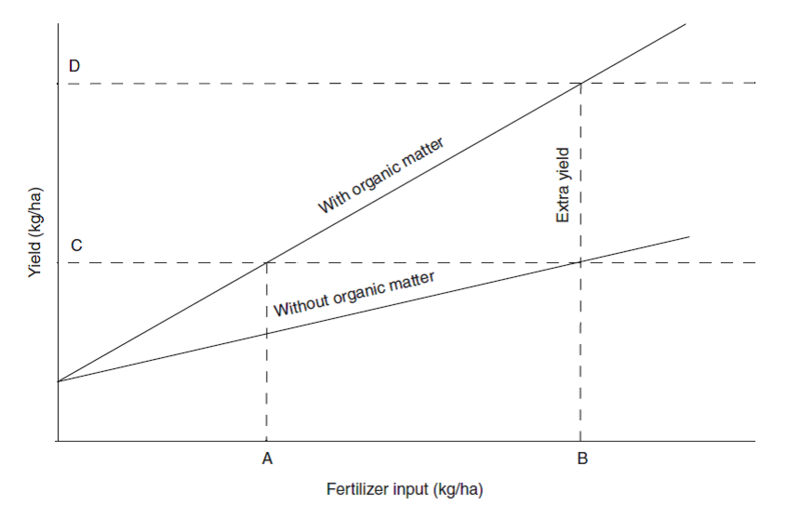 Application of liquid folia fertilizer would supply the nutrients. - Water harvesting: This is a way by which water can be preserved in the soil particularly during dry season. Use of organic mulch during dry season to reduce evaporation from soil is advisable. - Erosion control: Erosion washes away top fertile soil therefore should be adequately controlled through mulching, making of beds across slopes etc. - Plant spacing: When planting, the spacing should follow recommendation from the seeds companies or extension agent. The following should be considered: distance between rows, distance between plant on rows, number of plant per hole. - Weeding: Weeds compete with crops for light, water and nutrients and therefore should be eliminated on timely basis. Using the above resources put together would surely improve the contents of your soil and the output at the same time. However, you still need considerable knowledge of IPM to see good outcome. 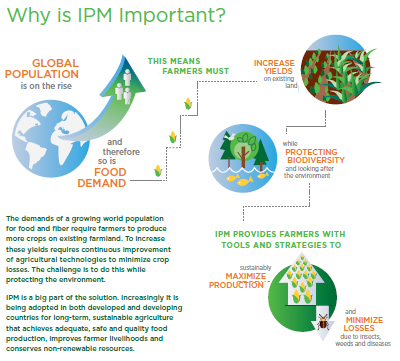 Let us go through what IPM means. There is no one size fit all measure in IPM approach. 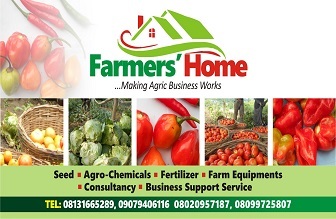 It depends all the best available materials to rural farmers which they can deploy to manage pest infestation without incurring un-affordable cost but having in mind human/consumers’ health during application. For farmers, IPM is the best combination of cultural, biological and chemical measures to manage diseases, insects, weeds and other pests. I hope you have learnt something about ISFM and IPM. You can learn more by visiting our referenced sources below. Also look through PICTURES where Team Leader of HybridVeggies Farms delivers a training on ISFM/IPM at a demo farm in Epe, Lagos. Should you have any question, comment etc. please add such below.